Life and times on the Not-So-Urban farm. No, that's not me. It's Aine (pronounced Awn-ya) our little Nigerian Dwarf doe. I've been hard at work, though I haven't had much to say about it. Another year has passed and I've made 7 As in as many classes. It hasn't been easy. Last summer's drought took a lot out of me. I struggled through the fall semester, unable to concentrate and slowly sinking. By Christmas break I was in full PTSD mode. Yes, I have that. No, I haven't been dealing with it. To be honest, I thought I had it under control. It has been lurking just under the surface waiting for my stress level reach critical mass and blow it all up in my face. Blow it did. No sleep, flashbacks, bad dreams, no appetite, and panic attacks all day and all night. Asking for help is scary, but the alternative was worse. So I looked around for some help. Whether we call it luck or the intervention of a Higher Power, I ended up with a counselor who is exactly what I needed. Probably needed it a loooong time ago but I have it now and I feel extraordinarily blessed. The little farm keeps plugging along. 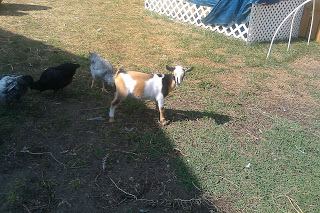 Goats are spoiled beyond reason and the chickens are so tame they don't hesitate to trot right up and stand on top of my feet. The years of working this soil are paying off. I may live in a shabby little house but my soil is gorgeous! New photos to come. Maybe even a video. Maybe. Okay, so I still design machine embroideries but the economy has closed some doors and opened new ones. Two years ago I would not have imagined I'd be farming and loving it! Life continues to be most interesting. I'm the Mom of a teenager, she's the joy of my life. I keep a large organic, biointensive garden and a bunch of chickens. I share my harvest through a small CSA and I set up every week at the farmer's market. Life has its share of surprises. Enjoy the ride.